After four decades in the wine industry, Harry McWatters, the spirited, fun-loving, and sometimes outspoken president of Sumac Ridge Estate Winery in Summerland, British Columbia, is stepping down. Harry’s accomplishments are legendary. He helped found the British Columbia Wine Institute, Wines of Canada, VQA Canada, the BC Wine Information Society, and the Okanagan Wine Festivals Society. 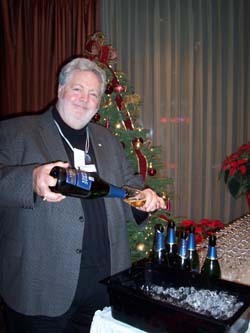 In 2003, he was a recipient of the Order of British Columbia and is considered instrumental in propelling British Columbia’s wine industry onto the global stage. But even more important, Harry is known and loved for his tireless commitment and enthusiasm. To be in a room with Harry, is to be instantly caught up in a contagious passion for all things wine-oriented. His wit is razor sharp, his smile impossible to resist, and few can match the sheer depth of his knowledge. But there’s clearly no slowing down on Harry’s immediate horizon. Effective May 1st, 2008 – the day after he officially steps down as president of Sumac Ridge – Harry intends to begin work establishing The Okanagan Wine Academy, an educational program offering in-depth wine educational programs primarily to consumers. In addition to providing consulting services, he will also continue on as president of the Black Sage Vineyard. Like everyone who has ever had the privilege of meeting this incredible man, we wish Harry every success and look forward to seeing what shifting gears will bring. We’ll also be first in line to try out some of his Wine Country Cooking recipes. This entry was posted in BC Wines and Wineries, Harry McWatters, Steller's Jay, Sumac Ridge Estate Winery and tagged British Columbia, Canada, Okanagan, Ridge Vineyards, Sumac Ridge Estate Winery, Summerland Winery, Vintners Quality Alliance, Wine. Bookmark the permalink.